In Vancouver, you’ll have plenty of opportunities to see wild animals venturing into your garden or down a busy road. 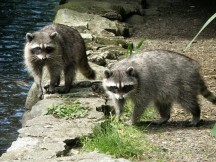 From garbage-raiding raccoons to skunks under your shed, frequent contact with humans makes these animals bolder. Conflict between people and wildlife in the city often results when wildlife lose their fear of humans because people are feeding them (intentionally or unintentionally). This may result in animals becoming more aggressive with humans or cause them to begin dwelling on people’s property. If you are looking for information on coyotes, check out our Co-Existing with Coyotes program. Injured wild birds and mammals need professional help and skilled treatment provided by wildlife professionals. Remember that these animals are under great stress, often in shock, and in a defensive mindset. Not only might they be dangerous to you, but you might also damage or kill that animal by causing it undue stress. If you see injured wildlife or suspect that it has been orphaned, please contact the Wildlife Rescue Association of BC at 604-526-7275. Little is known about the local bat species in Vancouver. Approximately 7 species, including the little brown bat, big brown bat, and Yuma Myotis have been identified seasonally, making their homes in buildings and under the bark of trees in Stanley Park. All bat species in BC are insect eaters and can often be seen on summer evenings flying over open areas. If you find a bat, contact your local health authority with any safety concerns – especially rabies-related – before acting. You should never handle a bat. If you encounter a bat during the winter months, hanging upside down in a state of torpor/temporary hibernation, it’s best to let it be. As spring arrives, the bat will awaken and leave your attic. 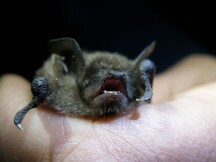 For more bat info please see South Coast Bat Action Team. If you believe a marine mammal is in distress, contact the Vancouver Aquarium Marine Mammal Rescue Centre at 604-258-SEAL(7325). Don’t touch or try to move the animal unless you’ve spoken with a trained rescue specialist. Urban birds often select the roofs and balconies of residential and commercial high rises for their nest sites or roosting places. Pigeons, however, are more like permanent residents, active year-round. Encourage nesting birds to move elsewhere by clearing away nesting materials daily or by using deterrents (strips of porcupine wire). Avoid the use of sticky or tacky bird repellents as they can injure both bird and other unintended species. Once a bird nest is being established and eggs are laid, it is protected by law and requires a permit from the Ministry of Environment or the Canadian Wildlife Service to be removed. Please report any Canada geese nesting in the City of Vancouver to the Vancouver Park Board’s Wildlife Department at 604-257-8510. Has your pet been sprayed by a skunk? Forget tomato juice, vinegar and expensive shampoos. Mix one litre of 3% hydrogen peroxide, 250 ml baking soda and a good squirt of liquid dish soap and apply. It’s cheap and may be the only thing that will help remove the stench. If a raccoon or skunk has made a den in your yard or under your porch, it is temporary and will be vacated by late summer or early fall. They prefer dark, dry, quiet locales close to a food source. They will find food from nearby fruit trees, ponds, outdoor pet food, accessible garbage, composts – or in some cases – people feeding them intentionally. A raccoon tapping on your window is a sure sign that a neighbour has been feeding it for an extensive amount of time. Feeding wildlife is bad for both the animal and people. If you know someone is feeding them, consider sending them a note or having a chat; they probably don’t know that they may be contributing to problems down the road. Raccoon or skunk living under your porch or in your yard? • Give them a taste of their own medicine. 1. Pour two to three centimeters of bleach into a small bucket with an old rag, 2. Put a lid on with small slits or holes so the smell can escape, 3. Push bucket into the den area or access point and repeat. They do not like the smell and it may cause them to relocate. Do you think squirrels are nesting in your home? Once a squirrel mother has decided to make a home, they are difficult to remove and it’s best to let them be. It will only temporary and they will move on once the young have reached 7 weeks. Take this opportunity to patch access holes, chimneys and vents with thick wire mesh. SPES seeks to inform the public about wildlife management and works to enhance natural habitat for some of the creatures that co-exist with us on a daily basis. We currently have active projects on the monitoring and management of urban great blue herons and bald eagles nesting in the city. We also work regularly with the Vancouver Park Board to provide information for the successful management of wildlife through Best Management Planning.